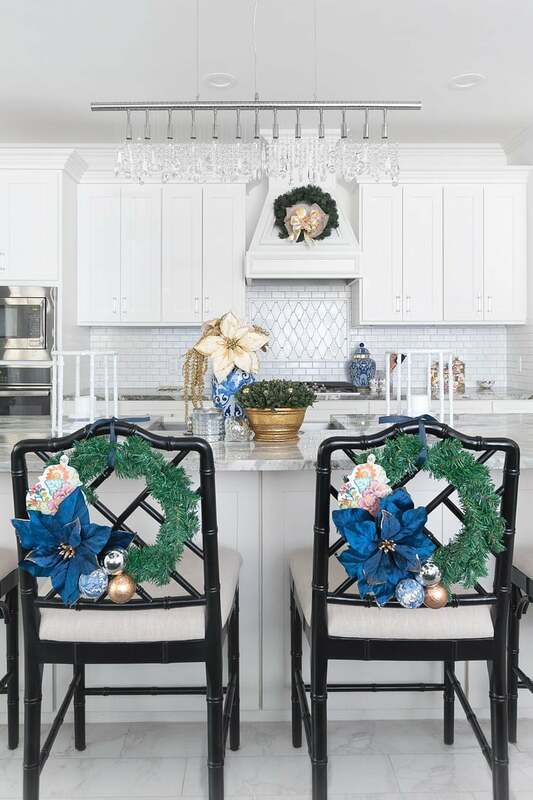 Earlier this week I showed you all my Christmas kitchen tour, and today we’re honing it in a bit and focusing on my easy DIY Christmas wreaths for dining chairs or stools. 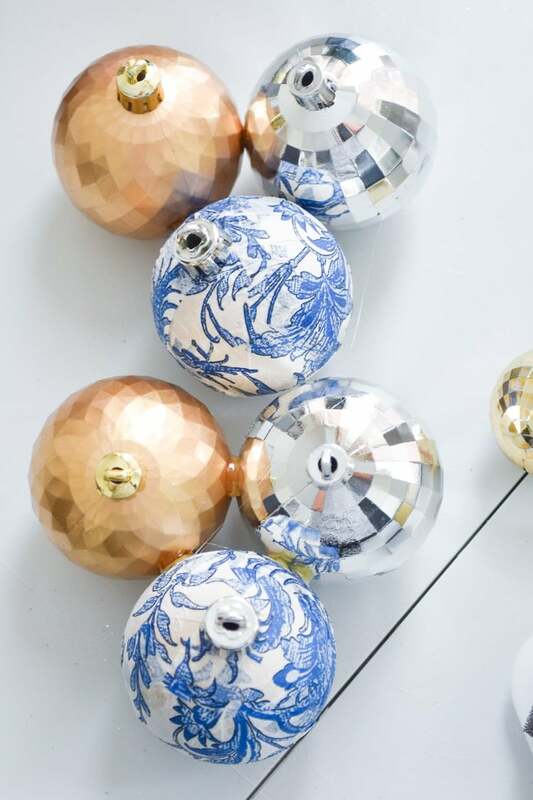 It’s an affordable, easy holiday home decor craft. 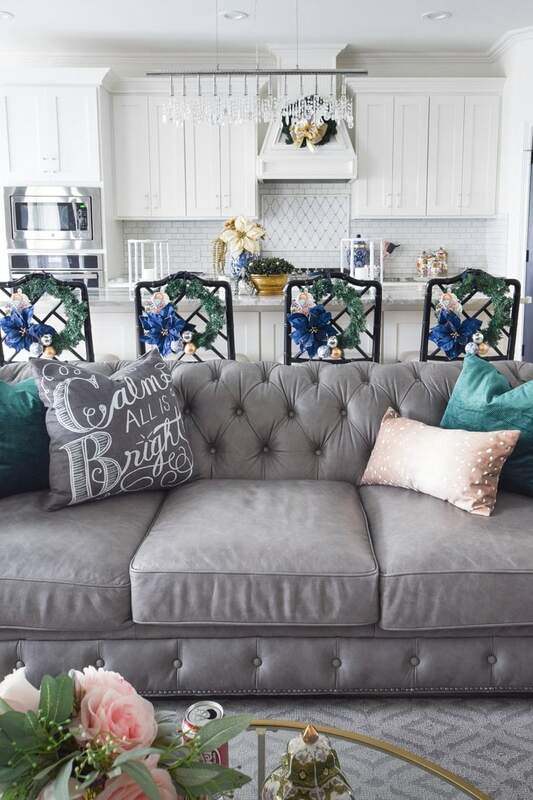 You all know my kitchen opens up to my living room and dining nook (the word room is a bit of a stretch for a 10×10 space), so I try my best to keep my kitchen clean and simple. 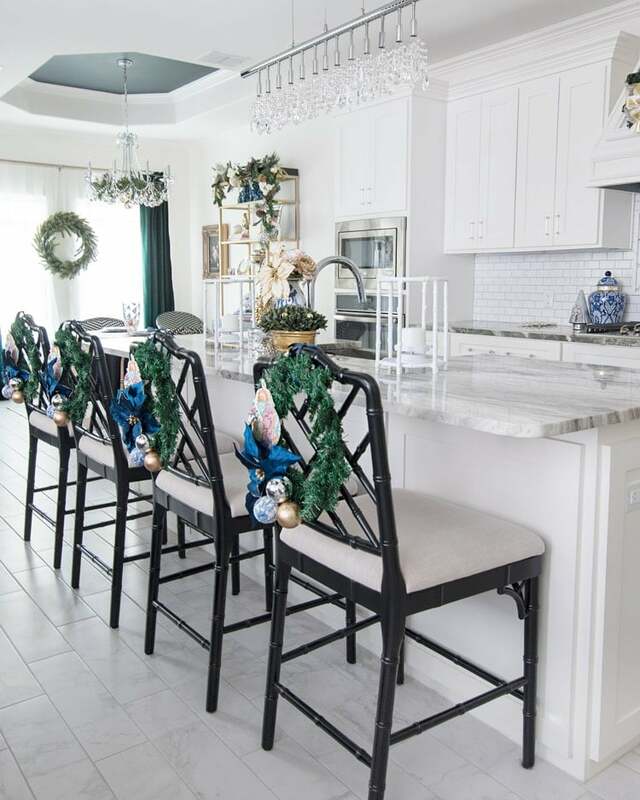 However, I love to decorate those beautiful dining stools of mine for the holiday season to add some color, glam and texture. 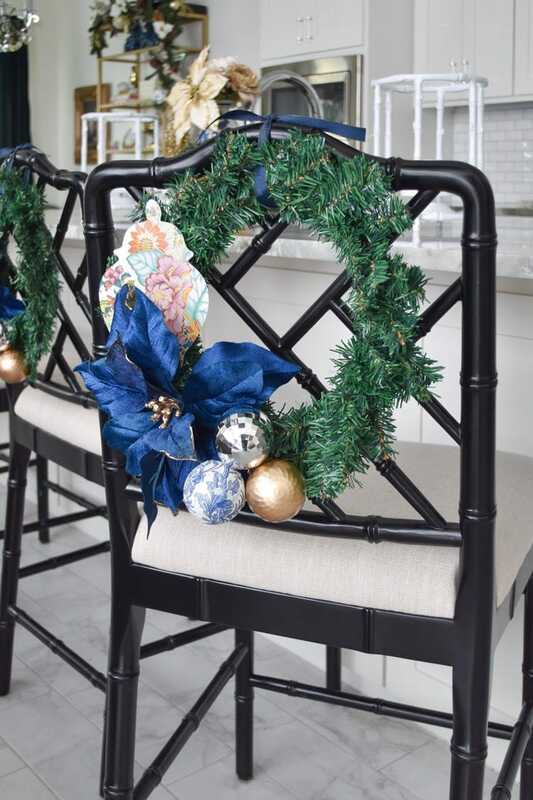 Why Decorate the BACK of Dining Chairs? 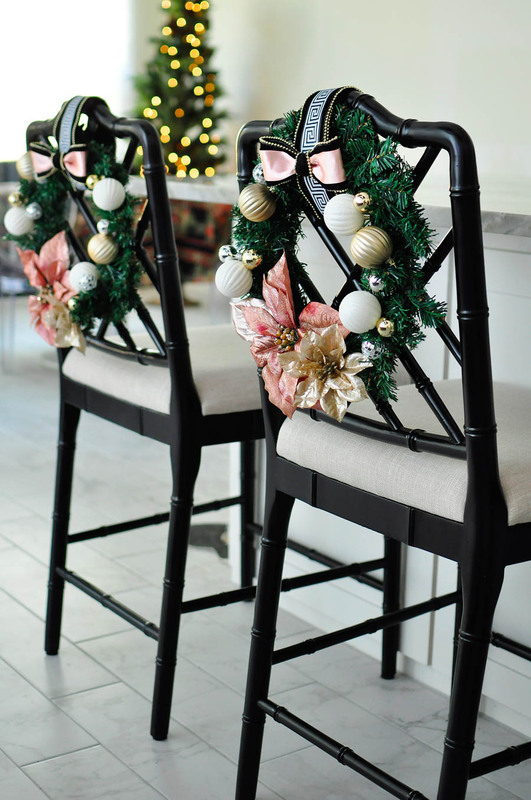 I got asked that question a lot when I first did a tutorial about my DIY blush Christmas chair wreaths last year, and the answer is to add more color and texture to your kitchen or dining space. 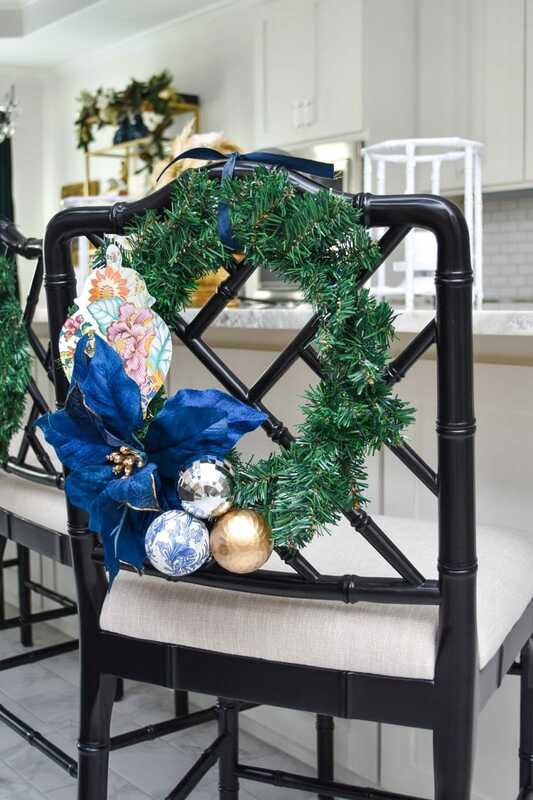 Even outside of the holiday season, decorating the back of your dining chairs or stools can help support any other decor you may have going on in the space. 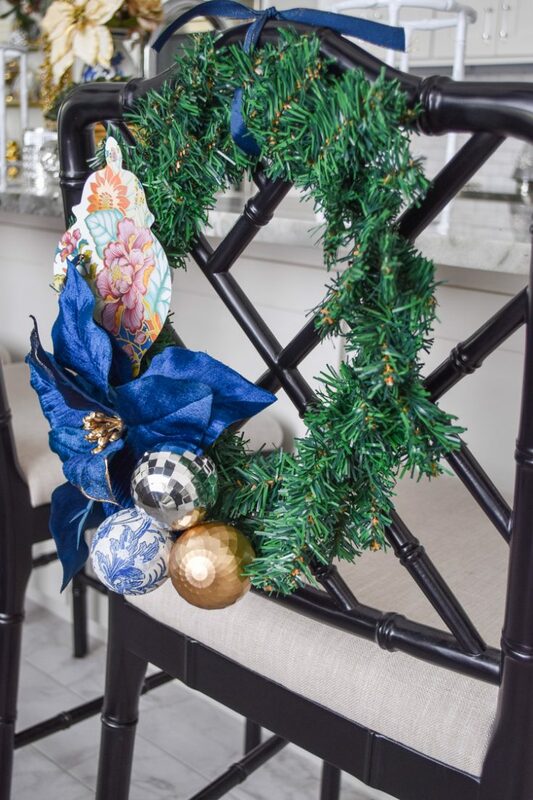 In my case, the wreath helps add a pop of blue amidst all my white walls, and I also incorporated some chinoiserie elements paired with some metallic finishes. 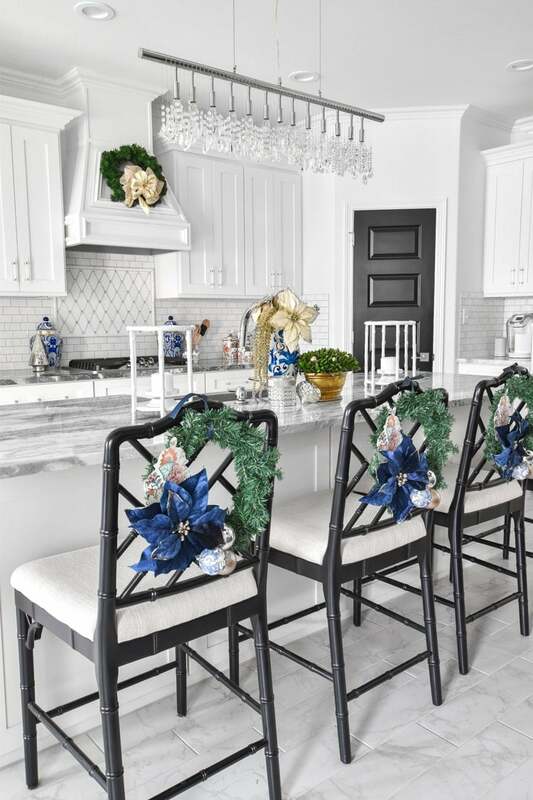 Plus, a wreath adds a pop of something natural. 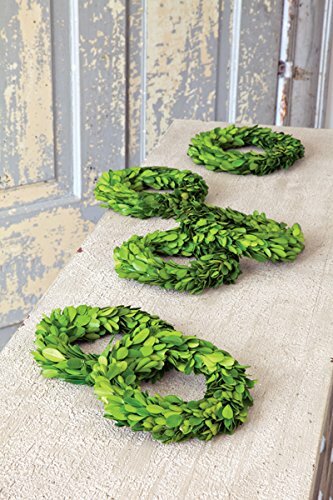 A simple mini boxwood wreath is a good year-round option. 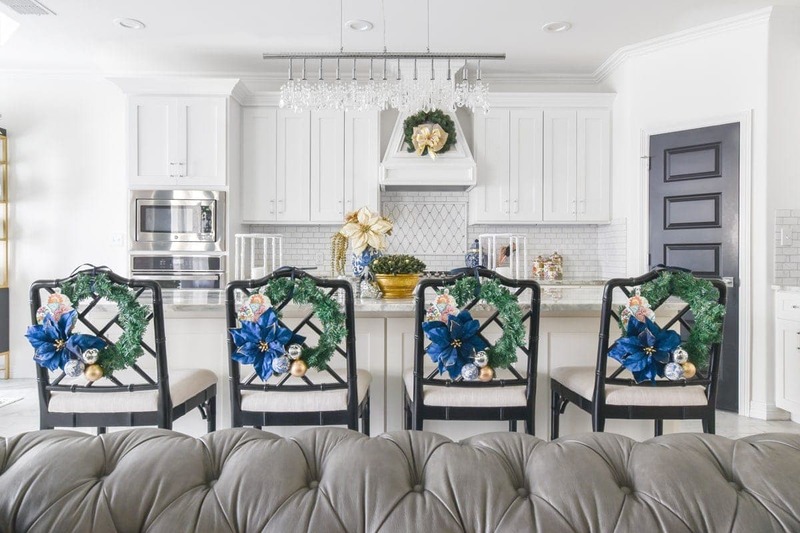 I suggest keeping the wreaths a bit on the smaller side for a traditional dining chair, but if you have a really wide counter stool like I do feel free to go a bit wider. 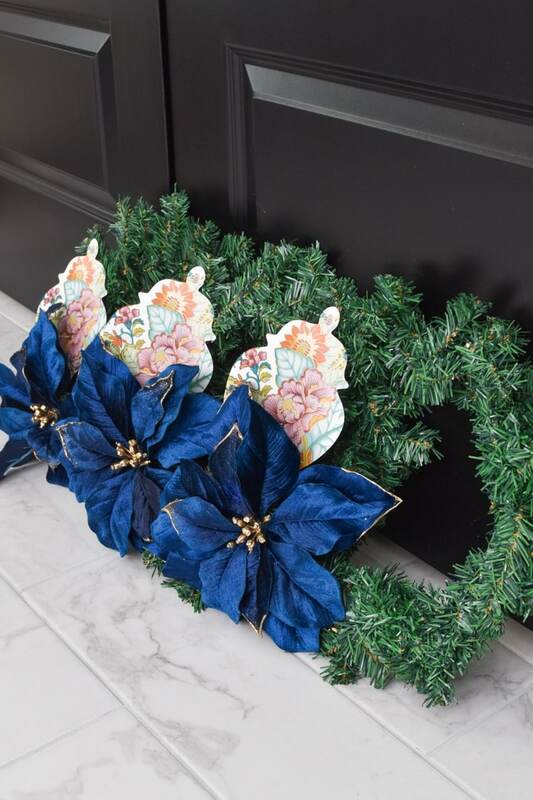 I doubled-up some 16″ inch wreaths from Dollar Tree for this project. And I know you’re likely here for the tutorial, which is super duper easy. Seriously, each one of these wreaths took less than 15 minutes to assemble. 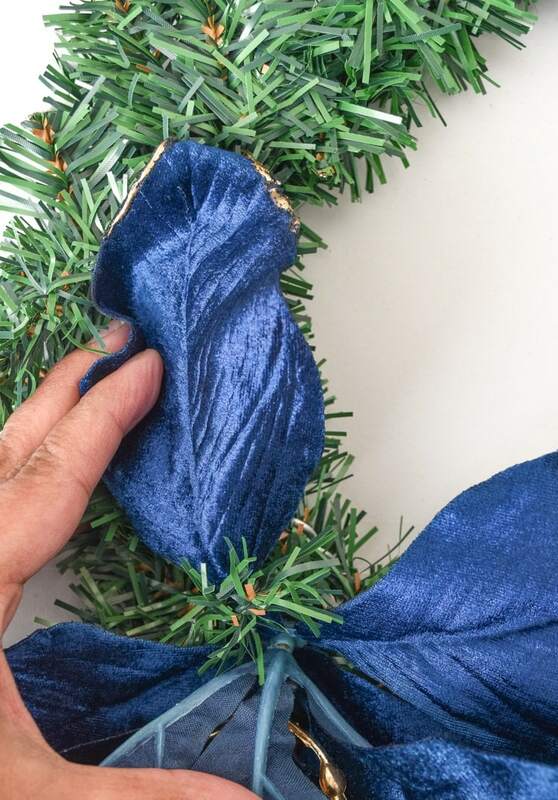 The first step is to print and cut your diecut, if you're using that sort of decor element in your wreath. I used a ginger jar SVG file, added in some tobacco leaf art work, print it out on white cardstock and had my Silhouette Portrait cut it out for me. Once the ginger jar is cut, place it under some heavy books to flatten out. 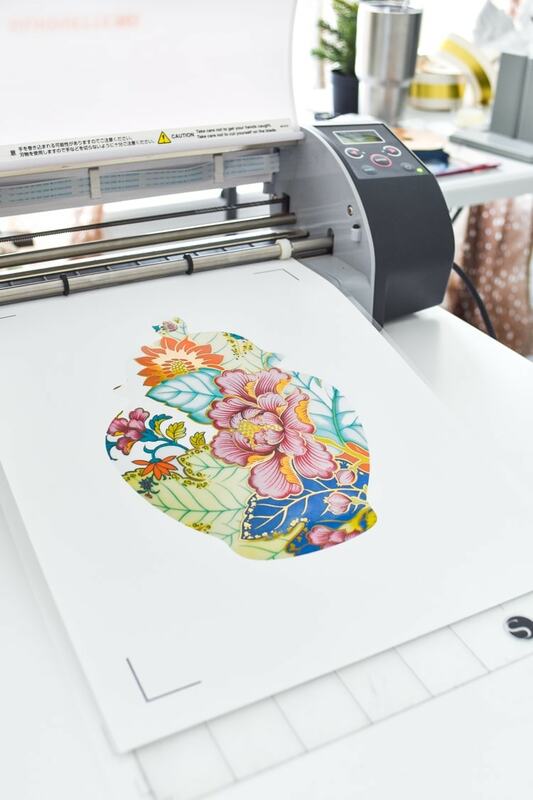 If you don't have a craft cutting machine, you could buy simple wooden diecuts at a local craft store, or print one out and cut using a craft knife or scissors. Next, I laid my wreath flat and attached one of my poinsettia flowers to the wreath by simply wrapping a branch around one of the back petals. 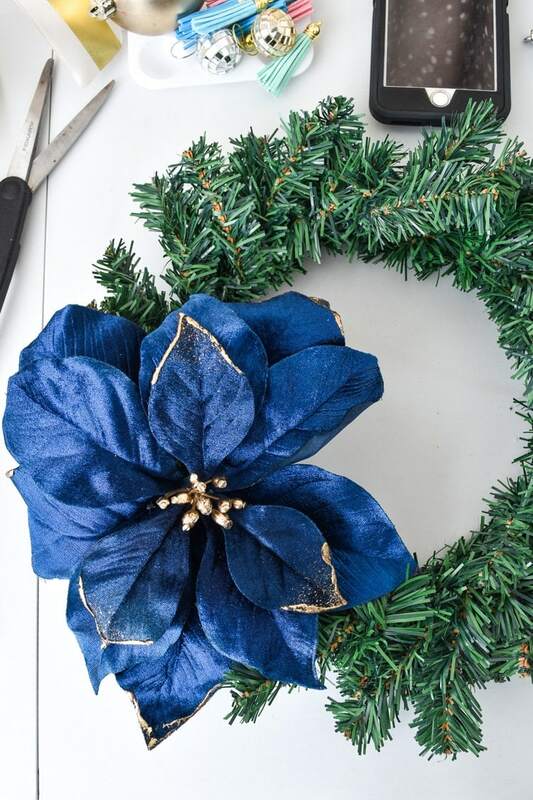 If you have a type of wreath where this isn't an option, you can use floral wire or hot glue to attach your flower. Now, it's time to attach the ginger jar to the wreath. 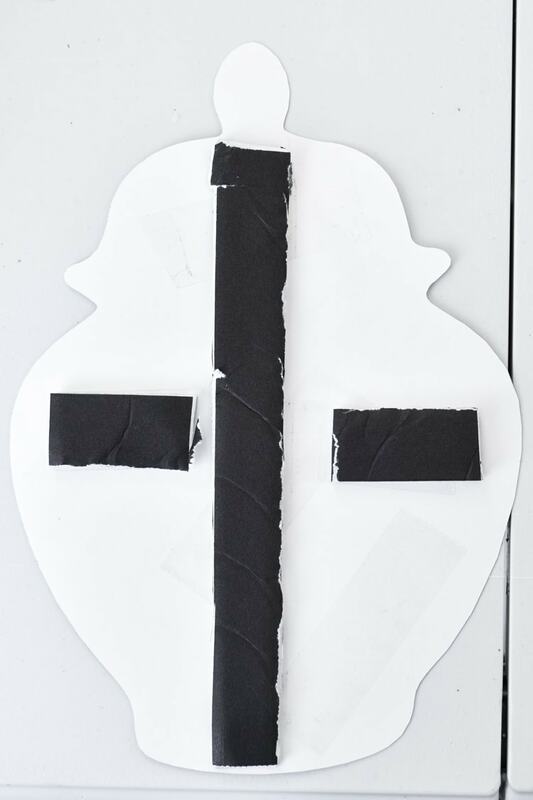 Although I used cardstock, I wanted to reinforce it a bit, so I added some strips of foam core board to the back using double-sided tape. You could also use cardboard if you don't have any foam board on hand. 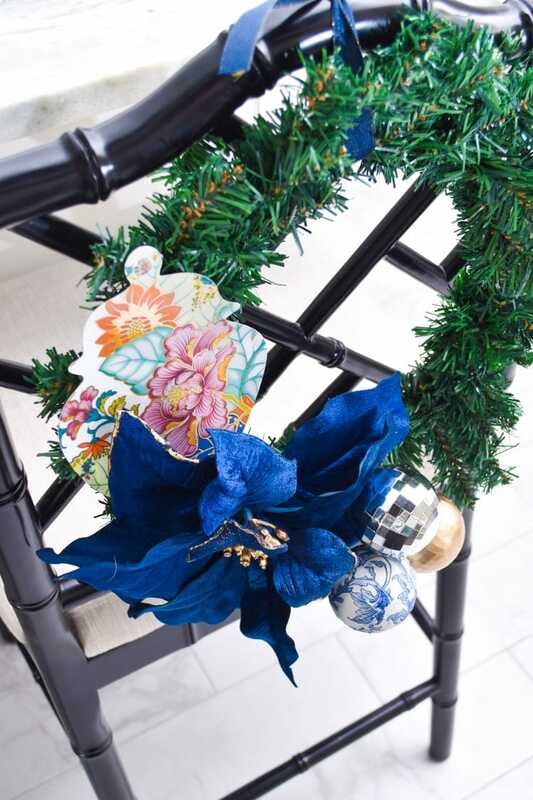 Place hot glue on the strips of foam core board and place the ginger jar on the wreath slightly behind the flower. Initially, I had stopped at this point, but after a few days I thought the wreaths needed more zhush. What I did was hot glued three ornaments together with the tops facing up so that they wouldn't pop off my wreath. 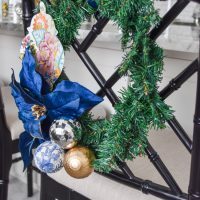 I hooked the trio of glued ornaments onto the wreath with some floral wire and attached to each stool using some simple navy and gold ribbon I found at HomeGoods. I simply love the bold pop of color they add to my kitchen space, and the majority of the supplies can be found at the dollar store. The blue velvet poinsettias are from Michael’s and were $4 each on sale, but I can definitely reuse them in future years. I typically tend to stick to my usual black and white plus pink/gold color combos, but I’m happy to step outside of my comfort zone and get a bit more fun with the colors. Who knew blue could look so good? I hope you enjoyed this tutorial and will share or pin it for later. Happy crafting!